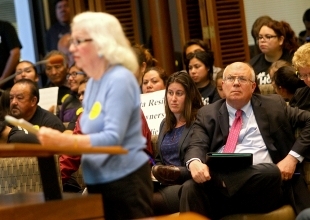 Santa Clara County Supervisor Joe Simitian listens on April 13 as supporters and residents of the Buena Vista Mobile Home Park talk about the impact of the park’s potential closure. The county Board of Supervisors has set $8 million towards the possible purchase of the park. Photo by Veronica Weber. As local officials continue to scour for ways to save Buena Vista Mobile Home Park from imminent closure, the attorney for the park owner warned Tuesday night that eviction notices could legally be sent to the Palo Alto park’s 400 residents as early as next month, when the closure application is set to be formally approved by the City Council. The council unanimously voted Tuesday to uphold a September decision by Hearing Officer Craig Labadie to approve the property owner’s Relocation Impact Report, which details the financial compensation owed to each resident, but ordered several revisions. These include a revised appraisal that takes into account the monetary worth of local schools and the safety of the Buena Vista community to its residents.